With everyone so happy about sharing their innermost feelings on social media it might feel like romance is dead. When it comes to a marriage proposal using digital means is most definitely not the right way to approach it, but what is a man to do if he wants to steal a woman’s breath away? The most traditional way is to get down on one knee and pop the question, but she might find that a little cliché and lacking in thought. It’s got to be an unforgettable experience, preferably in a good way, and it pays to have some well-thought-out words to say. If you want to propose to the girl of your dreams and be certain she says yes, there are some things you need to consider. It’s not a subject that comes up in conversation very often, but it would be a good idea to broach the subject of marriage before you splash out on a ring. You need to understand how she feels about such a commitment and gauge if she’s ready for it. Talk about your life together and discuss plans. Let her know you’re thinking about spending a lifetime together and see what her reaction is. Talking about the future and the possibility of tying the knot might save you a lot of heartache or embarrassment. It can also be a way of finding out whether she’s the right one for you. Whatever you choose to say, remember she’s going to remember your words for a long time. 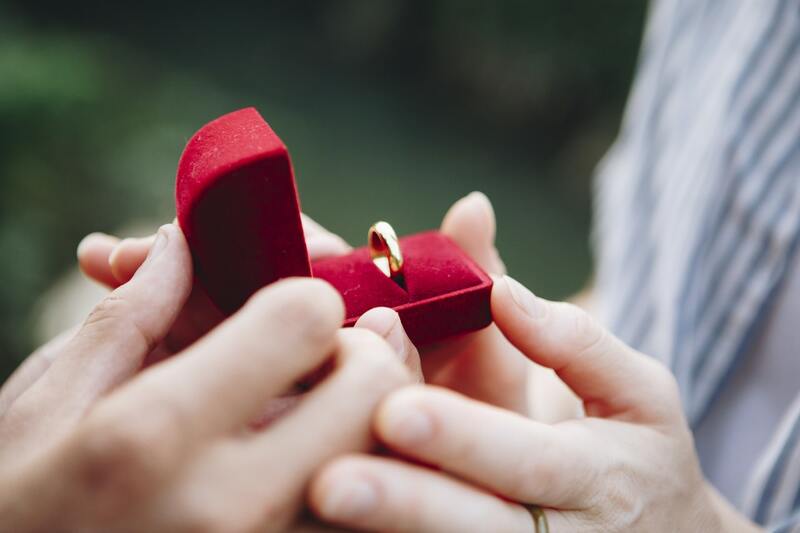 Before you make your proposal, you might want to ask for her hand in marriage. It’s a little old-fashioned, but it does show the respect you have for her family and those who raised her. When it comes to the words of your proposal, spend a few days thinking about what you’re going to say. You might not think you’re going to be nervous, but it’s best to make sure you’re not tongue-tied by practicing your words. Write down what you want to say and get in some practice. Think about what attracted you to her in the first place, and what caught your eye. Did you know from the very beginning that you wanted to spend your life with her? Focus on how much better your life is with her in it. If you have goals and values that you share use these to highlight why you should spend the future together. The answer to these questions make the perfect lead up to the words she’s waiting to hear. When are You Going to Propose? You could take a risk and simply wing it. After all, it works in the movies. However, a much better line to take is to take the time and pull all the stops out. It will give you more brownie points and show the thought and effort you’ve put in to make it a special event. Think very carefully if you’re planning to do it in public. It might be trendy at the moment but are you really that interested in YouTube views? Bear in mind that making it public is putting more pressure on her to say yes and could make her react in an unexpected way. A marriage proposal should be a personal and private thing. If private is not your cup of tea take her to her favorite restaurant and propose over dinner. You shouldn’t be aiming for a diamond so big she struggles to raise her hand when she’s wearing it. The answer is not to go big or go home. It should be an engagement ring that fits her personality and your budget. It is possible to buy an engagement ring without breaking the bank, and there are financing options which can be used to stretch your budget a little further. Online installment loans are one option worth considering. To help you pick the best engagement ring, take a look at the style of clothes she prefers to wear. Is she “a jeans and t-shirt” kind of girl or is she more of a contemporary dresser? This will help you decide whether simple is better or something more ornate. You could always ask her friends for their advice. While you want the answer to be yes, you should also be prepared for a negative answer. You can’t force her to marry you after all. Do everything you can to make sure she says yes, but at the end of the day, her happiness is what matter most. If you’ve got the smallest of doubts about her answer, don’t let her see it. Pop the question with confidence, stay positive and feel secure when you ask her. If she says no, don’t think of it as the end of the world. Consider your reasons for wanting to get married and decide whether you can come to a compromise. Just because she’s said no to marriage, doesn’t mean she won’t want to spend the rest of her life with you by her side. You must feel pretty pleased with yourself now she’s said yes but what now? Before you start sharing the news with friends, family and the world of social media, spend some time celebrating privately. Having your proposal accepted is a magical time in your relationship and should be savored. The next step is to start making plans for your wedding. When and where it’s going to happen are details you can enjoy making together. Decide on an outline for the wedding, allowing for compromises to be made and each of you to be very candid with your thoughts. Your wedding day is going to be very emotional, and it’s important you’re both on the same page. Some details may be overwhelming, and you need to be there for each other throughout the planning. Having A Wedding Anniversary? Renew Your Vows & Say “I Do” Again.